This cute dino tee is one of the softest fabric tees I’ve ever personally worn. It’s lightweight fabric and isn’t to hot or see through. It’s just perfect. Made of 60% cotton and 40% polyester = 100% awesome! It fits just right in all the right places. The arms are perfect and don’t give you a discomforting feeling when wearing it. It doesn’t choke you around the neck line and I can’t stand a tee that does that. 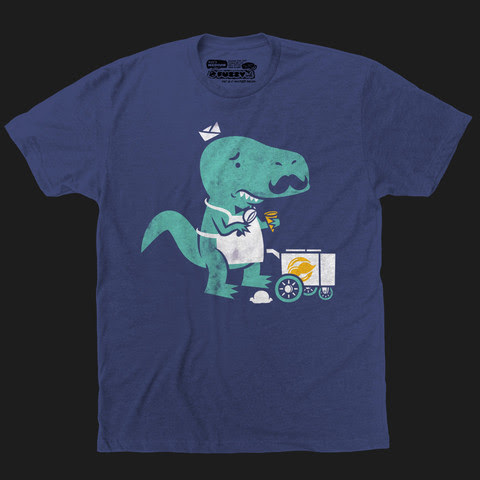 If you look, the dinosaur is wearing a muststash making him really cute. The ink on the shirts are screen printed. They are not too bright but show up just right for the color of the tee it’s printed on. It is not a dull color either.